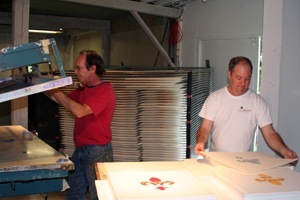 and inspecting the "Fleur de New Orleans" silkscreen prints. "Ken Kenan’s artistic tribute to the people of New Orleans is rich and uniquely personal. 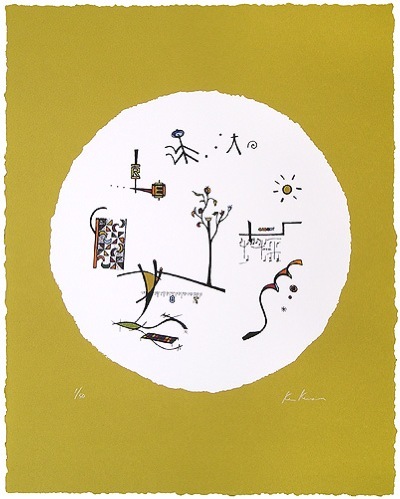 It treats us to a joyful playfulness of symbols moving in neutral fields, where visual fragments connect or balance one another. Kenan’s vocabulary and gestured abstractions are signatures seen in his earlier works. This suite moves consistently in its programmatic focus and flow. 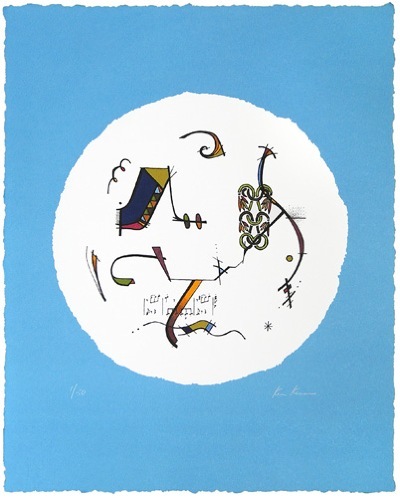 The artist’s voice here is also consistent with his personal artistic evolution; however, the symbols and their juxtapositions are used in ways that derive new meanings. The personal style crafted by Nahan is recognizable and the theme is understandable, but the results in this portfolio are unique. 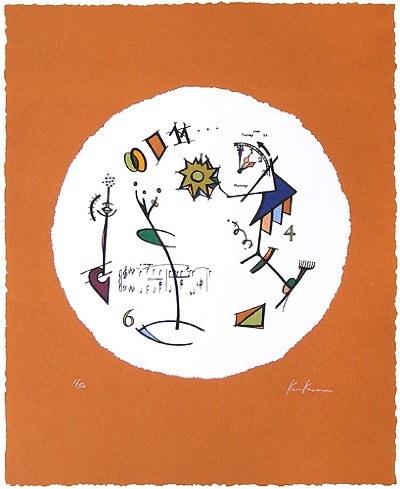 In their simple openness, Kenan’s serigraphs create visual environments that pull the viewer in. They invite meditations on the color of Mardi gras celebrations and the joyful music of the Crescent City. More broadly, they suggest near-conscious memories of Southern agriculture and commerce in the Delta milieu. Ken Kenan’s joyful improvisations shown here form a visual paean offered to those enduring tragedy in a place rich in history and beauty. The performance is given by a native son whose message is one of love and hope." 1. 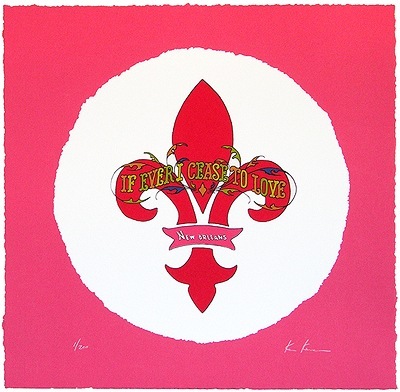 If Ever I Cease to Love Originally from a popular musical comedy of the 1870's, the song "If Ever I Cease to Love" was later adopted as the official anthem of the Mardi Gras Krewe of Rex. 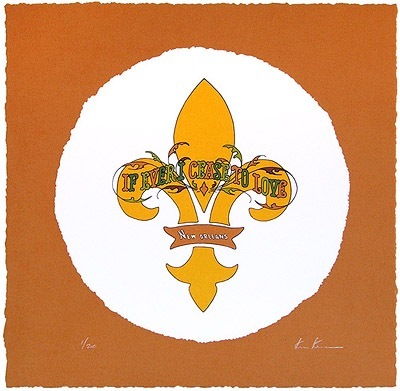 In this composition, the stylized phrase, lyrical lines, a musical fragment, and a small fleur de lis all evoke a fond remembrance of the grand history of New Orleans. 2. Autumn Morning Hurricane Katrina struck New Orleans and the Mississippi Gulf Coast region on August 29, 2005. As the weeks passed, with several of his close friends and family still displaced, the artist created “Autumn Morning.” A contained wall of blue, an ornamental flora motif and a musical fragment are symbolic of a sense of optimism and hope for renewal. 3. Retrograde Influences The word “retrograde” means “moving backward in space or time.” These influences affect us in times of great challenge, urging us to reexamine our sense of identity, and to reconnect with our roots and traditions. 4. Transfigurations Transfiguration: a dramatic and often surprising change in appearance, especially one that glorifies or exalts someone or something. In this piece, the world appears backwards, symbolic of our perception in the midst of turmoil. However, it is within these moments that one discovers a positive power to transform everything it touches. 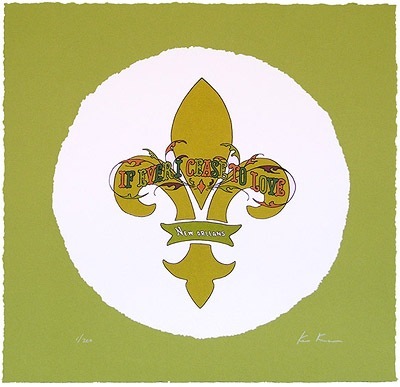 Inspired by the artist's indelible bond with the city of his birth, "Fleur de New Orleans" is a tribute to people of New Orleans. 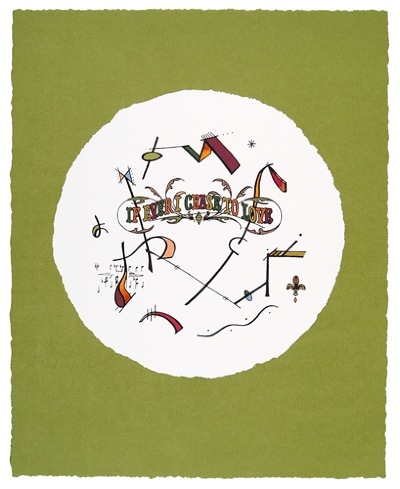 Created as a series of original limited edition silkscreens, each print measures 16” x 16” with deckled edges and is hand-signed and numbered by the artist. In his composition, Nahan superimposes the words "If Ever I Cease to Love" over the fleur de lis, the new symbol for the renewal of New Orleans. A song title from a popular musical comedy performed in New Orleans in the 1870's, "If Ever I Cease to Love" was later adopted as the official anthem of the New Orleans Mardi Gras Krewe of Rex. The melding of these elements evokes a poignant remembrance of the grand history of New Orleans, while inspiring hope for the revival of a great American treasure and it's citizens.